Follow these seven simple steps to launch a successful social media campaign for your brand. 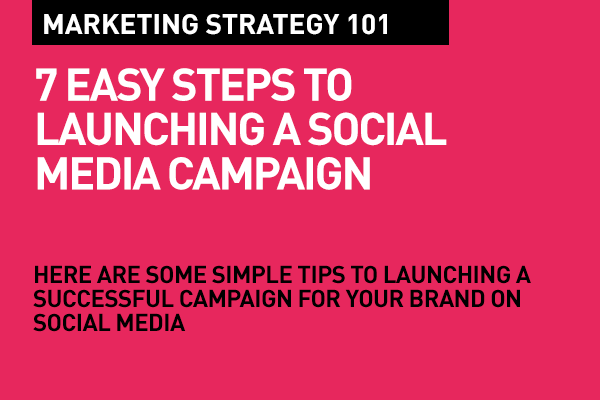 Whether you are a SME or a large business, a digital marketer or an agency, these easy to follow steps are essential for a social media campaign that will get you the results. Social media isn't a stand alone effort. Check with your colleagues and teams as to what their business goals are for the campaign you will launch. What are you building this campaign for? Awareness? Sales? Increasing customers or launching new product. Clearly define your goals and have a sense of direction. With this in mind have a budget in mind. How much are you willing to spend? What are your conversion goals based on that budget. Work towards your campaign with these parameters in mind. Once you have goals, you'll probably know who would be the best people around you – who have a decent amount of knowledge, and ideally both experience and expertise in social media marketing – to be on your campaign team. Remember, not every one will have the same enthusiasm for every campaign. Note that you'll need someone for strategic direction, for content creation and production, and someone who will manage the community and connect with your audience and track progress. Pick your best, before you begin. Your campaign can't do everything for everybody. As set out in your goals, you have a specific task for the campaign. Based on this, select which channels or platforms you want to be on (or should be on). Every kind of content has one or two specific channels that are best to deliver that content on. What you can do on YouTube is very different from what you can do on Pinterest. Or Twitter. Do a proper bit of research on your target audience. and what goals you have defined, and then set a channel strategy for the campaign. 4/ Define the objective in detail and what value will the campaign bring? The first step in this direction is to get solid customer insights. Once you know more about your target audience, and what value you can provide for them in your campaign, you need to set out these objectives in detail. What is exactly the one single purpose of the campaign? Are you offering a discount or a special offer? Is his a seasonal campaign? Are you trying to create better brand awareness? Is it a 'how to use our products better?' or a customer service oriented campaign? This wil help define the next step – content creation. Do you have a content strategy? One that will resonate with your goals and your objectives? Is content going to be for long or short term? Does it provide value? Is it useful? Will your audience come back for more? Ideally, any content you create as a brand should be able to attract your target audience. That's the opening position. You need to come across as someone who's there with the right information for what they're looking for, and that you are the authority on that information, that topic. Your content needs to engage and build a sense of 'need' – that's how you build affinity or loyalty to your content. Finally, a brand's content after all, isn't there for charity. You want your audience to take some sort of action – to buy your product, to share your content, to believe in your brand. You need to drive towards that end game. Content usually responds to a need. Your content should be there as a solution, as a response to that need. Your content needs to be there in our search driven world. Before you set out on developing a content calendar or create a content strategy, you need to have a grasp on what your audience expects from you as a brand. A good content plan is built around the customer. One important way to succeed with your brand's content marketing efforts is to get content distribution strategy right. You may be creating amazing content, but unless you add the value of 'context' to that content – meaning distribute them across relevant platforms and media, your content will remain distant and irrelevant to your target audience. Once you know where and how you will engage with your audience, define when. Do you need to post once a day? Twice? Or does your campaign feel right for just once a week? And when also means on which platforms at which time of day. Once you launch your campaign – across the platforms and channels that you have defined as best suited for the purpose and detailed objectives, you need to track your performance, you need to continuously engage with your audience – following up, listening to what they say, answering back, and tracking your performance. And you then use what you are learning either to replenish your campaign, perhaps revise it, fine tune it, and keep at it. Please share this with your friends and colleagues, and do feel free to add your comment. Thank you. Pay Per Click Advertising Really good advice!!! Thank you for the valuable information. If you are in pune and want to become a digital marketing courese in pune here are the best digital marketing certification. We are the fastest growing Digital Marketing Agency in Rajasthan and fully committed to provide best services to the clients with the wide range of creative and digital services. Nice information post, these all tips are good, good job. Creating the distribution strategy is an effective way of reaching out to the target customers and so the content strategy needs to be planned ahead to achieve the goal in promoting the product. This is how marketing consultant Sydney’s site on https://matt-gall.com/ do their approach. Nice blog! Lot of information is helpful in some or the other way. Keep updating the blog, looking forward for more content...Great job, keep it up. Nice content. Thanks for sharing. Digital Marketing Agency in US . I truly like you're composing style, incredible data, thankyou for posting.for information regarding digital marketing services please visit to the link. Great Information you have provided for eCommerce site. I appreciate your Stuff. and marked it as bookmark for future purpose.